The Houma Fire Department serves approximately 35,000 people, and we are 1 of only 32 departments out of the 605 fire departments in Louisiana to receive a Class 2 rating by the Property Insurance Association of Louisiana (PIAL). The mission of the City of Houma Fire Department is to protect lives and property through the prevention and/or mitigation of fires and other emergencies. This mission will be accomplished through a variety of programs that are hereby established with life safety, property conservation, and cost effectiveness in mind, in that order. The City of Houma's Save Your Neighbor program was created to ensure that every home has a smoke alarm. If you live within the city limits of Houma and need a smoke alarm, contact our Fire Prevention Office at 985-873-6391. Want to work for the Houma Fire Department? Applications for a Civil Service Entrance Exam can be obtained at the Central Fire Station or from the Louisiana Office of State Examiner website. 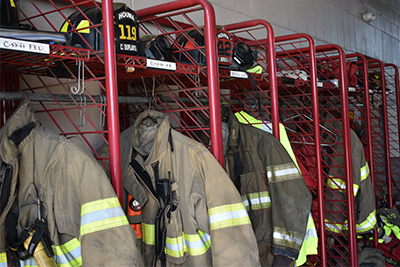 The City of Houma Fire Department is a full-time career fire department. Our jurisdiction covers the city limits of Houma, Louisiana. It is made up of 60 personnel, 54 in the Operations Division and 6 in the Fire Administration Division. All shift personnel are at minimum certified Firefighter I and either First Responder or Emergency Medical Technician. The City of Houma Fire Department responds to fires, auto accidents, hazardous materials incidents, medical emergencies, and various other types of incidents. The department averages around 1,900 calls per year.